From the mid 1960s through until the end of the 1970s, one of the most popular categories of paperback fiction was that of the gothic romance. Someday someone will surely document the history of the genre, but the day is not today, nor is that someone me, or at least not today. It is difficult to define exactly what is meant by a gothic romance. Seeing the cover is almost always a clue, or in other cases, the publishers denoted the category plainly on the spine. Of course this meant that some strange anomalies are included, such as the Inspector Finch mysteries by Margaret Erskine, which I have resisted and have always catalogued with the straight detective fiction in my collection. The category was so hot that publishers seemed to have to scramble hither and yon to find more and more books to put out. On one end of the category, the book Rebecca, by Daphne du Maurier, seems to be the quintessential gothic, and it very well may be the book that started off the demand for more books like it. As time went on, gothics from some publishers began to head off into the occult, containing hints (or more than hints) of the supernatural. Vampires especially came into vogue, with the many tie-in editions to the TV show Dark Shadows being the most obvious and overt example. Other publishers stayed primarily with novels of heroines in jeopardy, or “romantic suspense.” The latter category is what the entire genre seems to have evolved into, being a subcategory even now in Romantic Times, the monthly guide to women’s fiction today. Now and then gothic paperbacks of the old original variety appear on the shelves of Border’s, often as one of Harlequin’s Intrigue series, but neither they nor any of the various other lines that have been attempted in recent years have shown any success in terms of bringing the genre back to any fraction of its former days of glory. The gothics of the present-day variety have become more and more sexually explicit, along with all of comtemporary romance fiction. The books of the 60s and 70s were remarkably chaste, which may be one of the reasons behind their downfall. When the “bodice-ripper” form of historical romance came along, female readers seemingly sat up and took notice. As the category, gothics may have seemed awfully tame in comparison, and they soon began to disappear. Or at least that’s my current hypothesis or theory, for whatever it’s worth. The borderline between the gothics and romantic suspense is difficult to maintain in any precise fashion, but using my own personal guidelines, the books below are the ones I consider to be gothics, in the same sense that the term was generally assumed to mean while they were being published. I catalog the romantic suspense books separately, and therefore I contradict myself, as you will notice that Rebecca is included with the latter and not the former. As I say, I call them as I see them, or vice versa. I have catalogued approximately a third of my accumultion of gothic paperbacks so far, and there are many, many others I do not (yet) own. I can’t possibly have them all, can I? All of the books below are listed in Al Hubin’s Crime Fiction IV, but of course he does not categorize them as gothics. It is quite likely that other than right here and nowhere else will you find so many gothic paperbacks identified as such in one place. At the end of each listing is the number of the storage box that the book is in, along with a note on the condition and (sometimes) an identification of the cover artist, if known. At a later date, one hopes, more cover images than just this one may be included, although surely you are familiar with the common theme: a young lady, often in nightdress, fleeing a castle or manor house behind her in the clouds and darkness. There is usually a light in the windows, or several lights, but not the reassuring sort of lights that will draw the young lady back, but one which will only impel her away. Note: Most of Bingham's books are in the Mystery list. See the Romantic Suspense list. See the Romantic Suspense list for later [non Ace/Dell/Lancer] paperbacks. Note: Some titles are listed in Romantic Suspense. 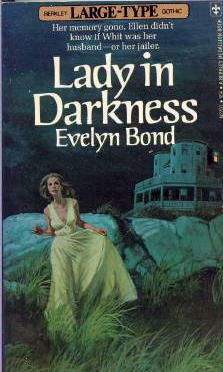 Some titles are listed in Romantic Suspense. See also the Romantic Suspense list for later [Fawcett Crest] titles. Note: Date of publication, January 1969, given in 2nd pr. below. See also JENNIFER WILDE writing as EDWINA MARLOWE. See also the Romantic Suspense list for later (non-Ace) paperbacks. See the Romantic Suspense list for most of her books. See FLORENCE STEVENSON & PATRICIA HAGAN MURRAY. See also DOROTHY EDEN writing as MARY PARADISE. See E. Œ. SOMERVILLE & MARTIN ROSS. See DOROTHY DANIELS writing as HELEN GRAY WESTON. Note: Although some books are stored with Gothics, all are listed with Mysteries. Copyright © 2006 by Steve Lewis. All rights reserved to contributors.